Former President Mel Zelaya's delegation to the Honduran mediation talks in Costa Rica includes his close personal friend, Milton Jiménez Puerto, who I've written about before and again before that. 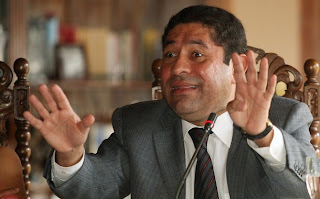 Milton Jiménez, former Minister of Foreign Affairs, became famous when a video on YouTube showed him getting into a drunken brawl with Honduran police on December 30, 2007. He had been stopped for drunk driving and taken to the police station for a blood-alcohol test, which he refused. Apparently after not receiving the 'special' treatment generally accorded to 'important' people, he drunkenly ran across the room and started taking punches at a group of police officers, not a wise thing to do in a police station. In the video, an officer is yelling, "Don't hit him!. Don't hit him!" After Jiménez is pushed to the floor, the officer yells, "Pick him up." 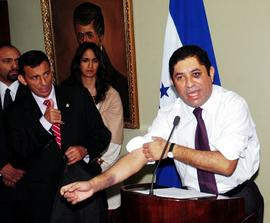 Honduran news was full of photos of the press conference in which he displayed bruises and a black eye. He apologized for driving drunk, blamed his bruises on police brutality, and resigned as Minister of Foreign Affairs on January 3, 2008. Mel Zelaya immediately appointed him Legal Adviser to the President. Six months later he was arrested in Miami for public intoxication and resisting arrest when he again was belligerent with officers who had stopped the car he was riding in for a traffic violation. He hit the leg of a police officer when exiting the vehicle though he had been told several times to stay in the car. Jiménez, in a telephone call to Honduran press, denied that he had been drunk, denied that there had been any confrontation or conflict with police, denied that he had been arrested, and denied that he had been held in jail. Hondudiario promptly confirmed that those statements were false after checking with the police and talking to the Miami Honduran Consul, who confirmed that Jiménez had been jailed for six hours until he proved his diplomatic status and was released. The Miami-Dade county prosecutor offered a plea bargain of a $50 fine and attendance in an anger management course, in lieu of the one-year jail term. Jiménez refused to attend an anger management class and instead, was ordered to do 15 hours of community service. In an August 2008 interview, Jiménez declared Hugo Chávez's speech in Tegucigalpa correct. He said that diplomatic speech should be left to diplomats. Chávez had called US President Bush a drunk and all Hondurans who were against ALBA "ignorantes and vendepatrias" (ignoramouses and fatherland sellouts). "You have to say what you have to say," said Jiménez. In December 2008, by presidential decree, Milton Jiménez was declared one of two people selected to receive a large financial settlement for being a relative of one of the 184 victims of 'detainment and forced disappearance' in the 1980's. The amount of his settlement was L. 8 million. The other compensated victim was Bertha Oliva, the president of the committee of the Detained and Disappeared Families, who was granted L.12 million. The other 182 families of victims were granted nothing. In Janurary of 2009, President Zelaya illegally named Jiménez President of the National Commision of Banks and Insurance. The bylaws of the commission specifically state that the President may only select from the list of candidates nominated by the Central Bank of Honduras. 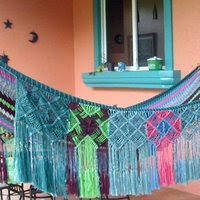 Three months later, in March 2009, an audit by the Tribunal Superior de Cuentas revealed ghost employees on the payroll of the Exterior Relations Department and other irregularities during the administration of the department by Jiménez. He denied the charges calling it politically motivated. Currently Milton Jiménez is among 40 functionaries whose bank accounts are being investigated for foreign transfers. The Fiscal Contra Corrupción expects to make charges of illegal enrichment. The Bravest Little Country in the World! 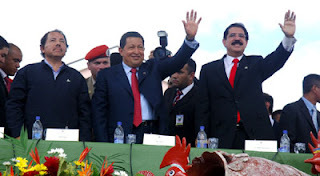 Zelaya: "Respect the will of the people"
Obama's Ghana speech: A message for Honduras? More corruption: The ballot counts are in! Can the Honduras crisis be mediated? Honduran crisis: What's the big deal with a poll? Should Zelaya come back to Honduras?